In Google Inbox, is there a way to get a permalink to specific messages or threads? 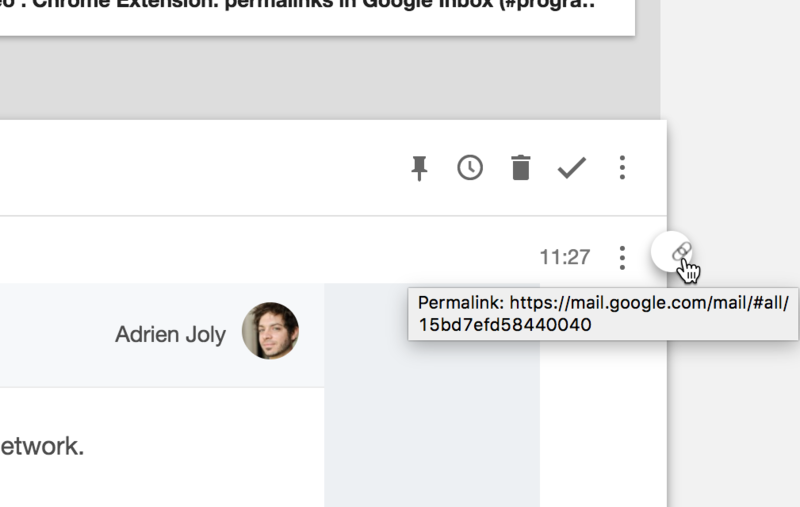 In Google Inbox (Google's new email UI), is there a way to get a permalink to specific email threads or messages? This could be done in Gmail simply by opening a thread, and then copying the link in the browser's address bar. [UPDATE]: There isn't a permalink to the read view of a message but you could use the URL that corresponds to the search for message ID. Inbox by Gmail (IbG) and Gmail itself are two different web applications. They have access to the same mailbox, some features are the same, some are similar and there are several that are unique to each of them. As I understand, IbG doesn't use URLs to set the message/conversation to be displayed as there isn't a single message/conversation view. It's worth to say that IbG has some task management like features: Pin, Snooze, mark conversations as done and set reminders. Use the URL corresponding to the search for the message ID to display only one conversation. Click on the three dots button of a message, then on Show original. Prepend rfc822msgid: to the front of the message id. Obtain the message id in the same way that Ruben did. This worked where simply pasting the message id didn't. I got this idea from Google Support. I just made and published an extension for Google Chrome that adds permalinks in Google Inbox. You can install it for free, from Google Web Store: Permalinks for Google Inbox. Yes there is, with caveats explained at the end of the answer. Just copy the subject of the thread, paste it in the search box between "" and press Search. The link you get back will give you the thread you need and can also be used by other people. If the subject is too general, just grab the from and to fields, a sentence in the body of one of the emails or even the date and put it in the search box as well. Some punctuation characters in the subject line such as pipe (|) seem to goof this up and need to be removed from the search string. To solve this replace replace | by %7C, @ by %40 and so on. Sometimes there's not a good way to avoid having multiple messages be returned, such as a subject like "Remote Dial In Instructions" where multiple emails are sent over time with the same subject line, recipients, and from address. While this doesn't answer the question directly, I hope this provides an additional solution that I find gets towards the goal of creating a task from an email. You can go to the tool icon in any project on Todoist and get an email specific to that project - including the inbox. When you send email to that address, a task is created in Todoist with the title of the subject, and you can embed labels, date, etc. in the subject as well. There are pluses and minuses to it. The main minus is that you're not linking the actual email, so there isn't the direct connection that there is with the gmail extension. It's also slightly more work than the gmail plugin in that you have to take the message you want to make a task of, and forward it to that email address, and you don't have the ability to customize the task very much within Google inbox - ie you need to manually type out label names in the subject, if you want to specify a different project than the inbox you would need to find addresses for all your projects and set them up as contacts in Google, etc. On the plus side, the text of the email gets embedded into a comment attached to your task, so in some ways it makes the link unecessary, since, at least for me, I used the link in many cases just to see the details of the email. This is of course not useful if the task is to email the person back, where having a direct link to the original email would of course be optimal. And the attachment often needs editing because Todoist doesn't format html email in a message and also gives you all the email headers, etc., so yet again, a bit more work if you want to have a clean and easy to read attachment. The way I set it up is to create a contact called "Todoist Inbox" so I can quickly press "F" then "Todo..." and it will come up. It works well, and what I find I can do is if it's something that I might need the original email again, I can snooz it and thus I have a task that has a secondary "reminder" by coming back to my inbox and I can then either archive permanently or go back to look at the task I know I created (since it shows it was forwarded to my Todoist Inbox) - check to see I've done it if I don't recall what it was about, etc. Not the answer you're looking for? Browse other questions tagged inbox-by-gmail or ask your own question. How to find an email in Gmail that was snoozed in Google Inbox? Is there a way to move attachments from Google Inbox to Google Drive? How do I get the compose window in Google Inbox to go full-screen/pop out? I can snooze Inbox by Gmail messages until “someday”. When is that? Is there any way to “star” or “favorite” a message in a thread in Google Inbox? How do I move multiple messages in Inbox?